Understand the true impact of in-store technology through Mercaux’s web-based portal. Capturing key metrics on content and real time usage activity, head office has full visibility of performance across the entire estate of connected stores. View actionable analytics on products, including most popular looks, top products, and track lost sales based on customer behaviour in-store. Unlock the black box and truly get to know your customers in store. Gain insight into the customer shopping journey, from popular products and looks to most common sizes requested. Connect the data with online behaviour for a true single customer view. Understand the funnel from when a customer engages with a sales associate through to check out. Track lost sales, stock outs, popular products and measure impact on conversion as a result of implementing Mercaux. View and download usage statistics on key events such as size checks, most viewed looks and recommendations shown. 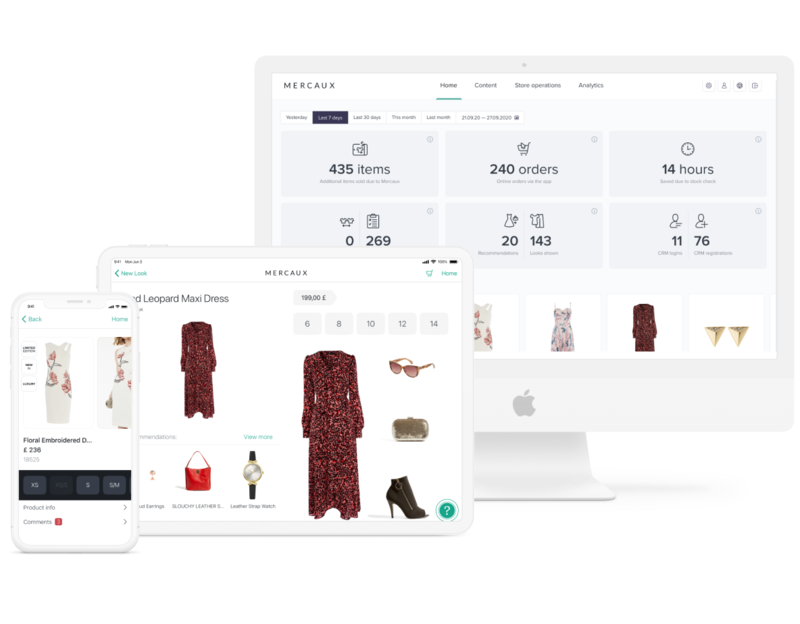 Mercaux provides full visibility on store associate usage and activity to truly understand your sales people’s behaviour.